Water Links provides quarterly updates from the West Metro Water Alliance (WMWA). Water Links features news, events, project updates and tips related to water quality issues. 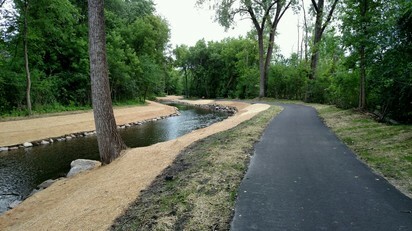 Bassett Creek streambanks were reshaped and stabilized. An erosion control blanket will protect the banks until native vegetation gets established. The Bassett Creek Watershed Management Commission (BCWMC), in cooperation with the City of Golden Valley, is restoring streambanks along a 9,500-foot reach of Bassett Creek from the intersection of 10th Avenue North and Rhode Island Avenue North to Duluth Street. Much of this stretch of creek was in poor condition with eroding and slumping banks, trees falling into the creek, and infrastructure in need of repair. Restoration that began last winter includes slope stabilization and reshaping, protecting the banks at the water’s edge with boulders, and revegetating the streambanks with native grasses and flowers that will offer shade and habitat. City staff worked with 70 different private property owners to gain access to the creek and discuss restoration techniques appropriate for each backyard. Now that the construction portion of the project is complete, native vegetation will be established along the banks and will be actively managed over the next few years. The completed project will reduce total phosphorus entering the creek by an estimated 60 to 100 pounds per year and will reduce total suspended sediment by an estimated 140,000 to 200,000 pounds per year. The total project cost was estimated at $1.5 million but is expected to be completed well under budget. If you live on a lake or creek, it’s probably obvious that rain or snow running off your property ends up in the water. But did you know that virtually every yard with curb and gutter can be considered shoreline property? Starting with the storm drain in your street, the storm sewer system runs beneath our urban and suburban landscape and leads to a water body in your community. Sometimes that water body is a pond designed to reduce pollutant levels before they flow on into a natural creek, lake, or wetland. But often, there is little or no treatment of runoff before it gets to a water body we care about. Grass clippings are a big source of phosphorus in our waters; one pound of phosphorus produces 300 – 500 pounds of algae! Leaves and other organic debris are another source of phosphorus. Lawn pesticide and fertilizer pellets are a source of toxins for aquatic life and another source of nutrients that will readily grow algae. Pet waste is a source of bacteria and nutrients. Salt for deicing is a toxin to aquatic life - just one teaspoon of salt permanently pollutes five gallons of water. In addition to keeping streets clean, an even better way to reduce pollution is to keep rainwater and snowmelt from reaching the street in the first place! Consider using rain barrels to capture and use rainwater, directing downspouts off driveways and into lawns or gardens, or installing a rain garden to soak up the runoff! If we all do a little, we can do a lot! A study in Wisconsin found that if not properly managed, the amount of soil washed into lakes, streams and wetlands for each acre under construction would fill 1 ½ dump trucks. Erosion is the natural process in which soil and rock is weathered and carried away by wind, rain, snow or ice. Sediment is the soil (with corresponding nutrients and/or contaminants) washed off the ground during erosion. It is considered a pollutant in lakes, streams, and wetlands because it decreases water clarity, buries rocky habitat on streambeds, and increases algae growth. Construction activities increase the ability of soil to erode because the topsoil is removed and the subsoil is exposed to the elements. Cities and some watershed organizations require a permit for disturbing as little as 10 cubic yards of land (about a dump truck full) and enforce erosion and sediment control requirements. Erosion control is the practice of preventing or controlling wind or water erosion in land development and construction activity. Erosion can be controlled through practices like seeding and mulching, laying down erosion control blanket, hydroseeding, and installing rip rap. Sediment control is the practices or devices designed to keep eroded soil on a construction site so that it doesn’t wash into storm drains and nearby waters. Examples of sediment control practices include installing silt fences, protecting storm drain inlets, and sweeping sediment off hard surfaces. Regulators say that a project of any size that disturbs soil requires erosion and sediment control to prevent degradation of water resources. 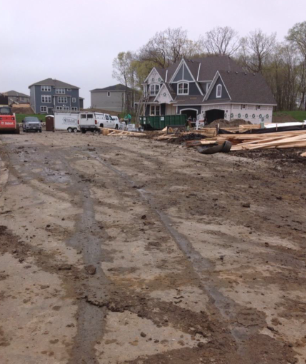 The City of Plymouth is one local entity inspecting active construction sites. In 2015, Plymouth staff completed 1,499 inspections. The new outdoor classroom at Connections at Shingle Creek. 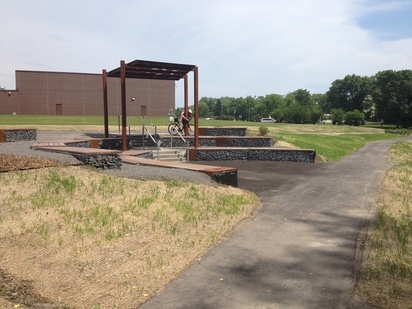 The cities of Brooklyn Park and Brooklyn Center have teamed up to complete a stream restoration project on Shingle Creek, partially in Brooklyn Center and partially in Brooklyn Park. The project includes construction of a missing trail link, stream restoration along 1,400 feet of Shingle Creek, and a new outdoor classroom adjacent to Park Center High School. Students at Park Center have monitored stream health and macroinvertebrates in Shingle Creek since 1996. The project will be complete this summer, ready for the students to use in fall 2016. Join the Mississippi River Watershed Management Organization (MWMO) for an evening of community, canoeing and ice cream! Stop by the MWMO office anytime between 5 and 8 p.m. for a free introductory canoe ride on the Mississippi River, then grab some ice cream and check out the other exhibits at the Stormwater Park and Learning Center. This family-friendly event is great for kids and adults of all ages (though you must be at least 30 lbs. in order to fit the provided life jackets). In addition to learning to paddle on the river, participants will also have opportunities to learn about the Mississippi River’s history, water quality, plants, animals and more. National Park Service rangers from the Mississippi National River and Recreation Area will be joined by MWMO and Mississippi Park Connection staff and guides from Wilderness Inquiry offering free canoe rides on the Mississippi River in exchange for your thoughts and ideas for river programming in the north and northeast Minneapolis area. Fireworks Friday and Saturday nights, live music nightly, bingo, kid's Parade and more. For more information and schedules, visit www.dukdukdaze.com. Featuring live music, food vendors, rides, Crystal Ball search, 5K, bags tournament, softball and more. Different events will occur at different parks in Crystal. For more information and schedules visit www.crystalfrolics.org. Summer carnival and environmental fair with activities and games for kids, Kid Power with Rachel performance 7:30-8:30 p.m., an interactive music and educational animal show with an emphasis on kindness. Learn more.